There are at least five recorded versions of the classic teen death disc Surfin’ Tragedy – well, I am aware of five and I present all of them to you today. No doubt if there are other recordings of this terrible song one or more of you will soon let me know. I first became aware of Surfin’ Tragedy when I purchased the first volume of Rhino’s World’s Worst Records compilation back around 1982. That particular iteration, recorded by the Breakers as the flip to their 1963 single Surf Bird, was bad enough, but discovering that this was, in fact, a cover version and that there were other recordings available opened up a veritable geyser of badness. Written by Robert J Hafner and Anthony J. Hilder, the original version of this hideous song appears to have been recorded by Doug Hume and was featured on the 1963 album Surf’s Up At Banzai-Pipeline. Tony Hilder was an A&R man for Modern Records, which was connected to the budget Crown and Custom labels. His first co-writer credit was on stomping 1957 single John John (released by Aggie Dukes on Aladdin records) and, in the early 60s, Tony Hilder became involved with surf music, producing Jim Waller's Surfin' Wild, the various artists album Surf War and the aforementioned compilation Surf’s Up At Banzai-Pipeline. He supervised recording sessions by California group The Revels, who had a hit with the instrumental Church Key, and was also president of Impact Records, a label that released recordings by The Revels, Lil' Ray and The Premiers, Dave Myers and The Surftones, and indeed the Breakers 45. He also worked in the movies and on and supplied the music for the 1961 film The Exiles. These days Hilder is an activist, investigative journalist, conspiracy theorist and talk show host. He’s also a documentary filmmaker, known for 911: The Greatest Lie Ever Sold, Polanski Unauthorized, E.U: Hitler's Dream Come True and Bohemian Grove amongst many others. Robert John Hafner, a songwriter, musician, aspiring actor and producer, wrote songs recorded by The Revels, including the fabulous, sax-driven Comanche, which was used in the movie Pulp Fiction, but in the late 60s he walked away from the music scene, turned off by the hippie movement, the drug culture and the corporate takeover of music. He and his wife-to-be moved to Idaho, where they were married in 1969. The couple moved to the Chicago area in 1982 to be closer to her parents, with Bob working as a house painter for more than two decades. He passed away in October 2013 aged 81. Anyway, back to the music. Here are all five versions of Surfin Tragedy, the previously mentioned vocals by Doug Hume and The Breakers, plus a third vocal take by The Sentinals (which appeared as the closing track on their 1963 album Big Surf! 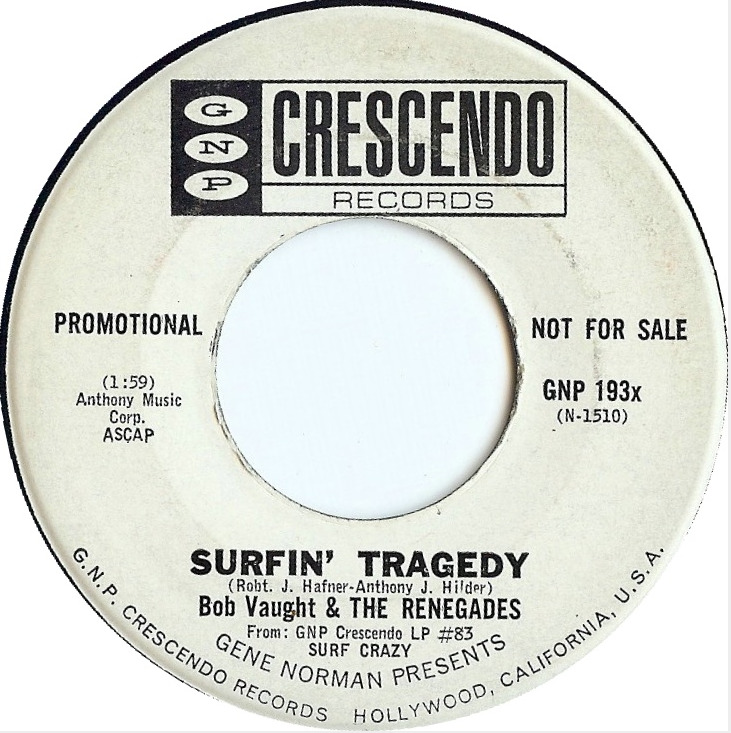 and, for my money, is easily the worst version ever recorded) and two instrumental versions, the first by Bob Vaught and the Renegades (issued as a single on GNP Crescendo and on their album Surf Crazy, both in 1963) and, finally, by The Surf Teens from their 1963 album Surf Mania. UPDATE: since writing this post I have become aware, thanks to WWR readers, of a sixth version, recorded by The Blue Hawaiians, which appears on their 1997 album Live at the Lava Lounge. I was directed towards this particular ghastly recording by our old friend The Squire – a man whose taste in music is possibly even more eclectic than my own – so you can blame him for my inflicting My Little Chicken by Cliff Wade on you. Cliff Wade is one of those obscure figures in British pop music who has somehow managed to maintain a career since the 60s without ever becoming a household name. As a songwriter he’s provided hits for Pat Benatar (Heartbreaker), Tina Turner (The Woman I'm Supposed To Be) and others and as a member of Fickle Pickle he scored a sizeable European hit with a cover of Paul McCartney’s Maybe I’m Amazed but, although he has issued several singles and written countless songs he’s never managed to score a hit under his own name. Originally from York, he played with several groups during the mid- 60s before forming the Roll Movement in 1965 (their first gig took place in December of that year), who beat The Soft Machine into the finals of a 1966 Melody Maker-sponsored competition, (they finished second) and scored support spots with the Who and Cream. Cliff was also asked to audition for the Spencer Davis Group following Steve Winwood’s departure. Unfortunately the sole single issued by the Roll Movement, I’m Out on My Own (written by Cliff) failed to chart and the band split soon after its release. Wade joined a new outfit — Cucumber — although they didn’t last long and, in 1968, he went to work for independent producer Monty Babson and his Morgan Studios set up. Cliff would spend his day as a music copier, transcribing every part of the orchestral arrangements, but he also used the well-equipped Morgan studio at night, recording his own material and often sleeping there. Morgan would become the place to record, with acts including Led Zeppelin, The Who, The Kinks, David Bowie, Pink Floyd and The Rolling Stones all spending time there. 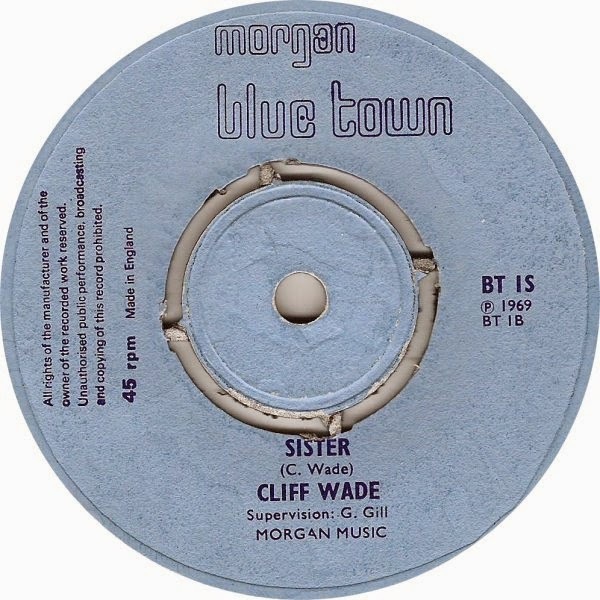 Wade first recorded under his own name in 1969, issuing the Mellotron-drenched pop single You’ve Never Been To My House/Sister on the Morgan Blue Town label. It sank without a trace, but over the next couple of years he cut more three more sides (and recorded a load of unreleased material which would not see the light of day until 2004). He also started singing for the group Fickle Pickle, who scored a hit in Holland with Maybe I’m Amazed and released several other sides for Philips, and had a minor role in later recordings by The Smoke (of My Friend Jack fame). Very little changed for the next decade: Cliff continued to work, writing songs and performing with various different groups until 1979 when at last he got his big break, co-writing Heartbreaker, Pat Benatar's first major hit. In 2004 Edsel/Demon Records collected together 21 tracks from the Morgan vaults - both sides of his two singles plus 17 previously unissued recordings - and released it as Looking For Shirley. Cliff Wade continues to write and record: actor Kevin Kennedy (Curly Watts in Coronation Street) had a minor hit with Cliff's song Bulldog Nation in 2000. Which brings us to today's horror. My Little Chicken is unrepresentative of Cliff Wade's other recordings which are, for the most part, in a sunshine pop/psych vein. It's an almost unfathomable aberration, and you can understand why it remained unissued for more than three decades. Did he intend this as a demo, offering the song to another act, was it a bit of fun during some free studio time or was he totally off his nut? Who knows. It is what it is - and for that I am truly grateful. Born on August 10, 1922 - exactly 42 years before me, fact fans - Al Alberts was an American singer and television presenter, and a founding member of the vocal group the Four Aces. Born Al Albertini in Chester, Pennsylvania, he met Dave Mahoney, co-founder of the Four Aces, whilst the pair were serving in the US navy. The harmony group scored several huge hits in the 1950s including Three Coins in the Fountain (written by Jule Styne for the film of the same name: Styne also wrote the scores to a number of hit Broadway shows, including Gentlemen Prefer Blonds, Gypsy and Funny Girl), which hit the number one spot twice in the States in 1954 and won the Academy Award for Best Original Song the same year. The Four Aces biggest hit was Love Is a Many-Splendored Thing, the theme to the 1955 film starring William Holden and Jennifer Jones. Love Is a Many-Splendored Thing stayed at number one for four weeks and again won the Academy Award for best song. Alberts left the group in 1958 to try to make it as a soloist. He issued his first album A Man Has Got To Sing, in 1959 but it – and subsequent releases – failed to chart. The Four Aces still exists today, although all four of the original members have now passed away. After leaving the Aces, although Alberts continued to record he became better known as a television personality. He hosted a one-hour Saturday afternoon talent show in Philadelphia, called The Al Alberts Showcase, that featured a panel of local children known as the Teeny Boppers - a bunch of camera shy kids who would tell lame jokes and occasionally mangle a show tune - and a group of young teenage dancers called the Show Stoppers. The show helped launch the careers of Sister Sledge and Teddy Pendergrass and Jarrod Spector, who first appeared on the show as a precocious three year old and who went on to play the role of Frankie Valli in the stage show The Jersey Boys. The show went off the air after 32 years, following Alberts' retirement in 1994. He died at his home in Florida in November 2009. 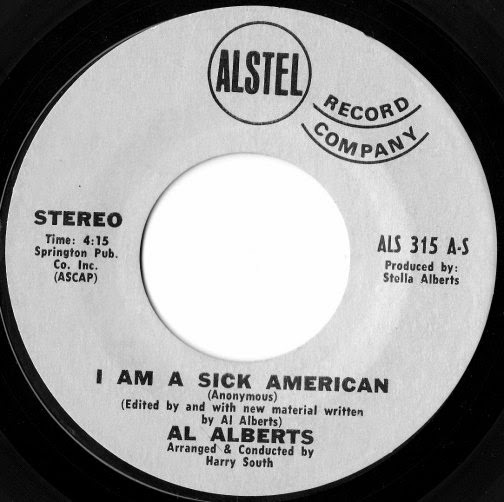 Although undated, this particular piece of dreck – I Am A Sick American – was one of Alberts’ last single releases; the song copyrighted in the first half of 1974. The unusual writer credit - Anonymous: edited by and with new material written by Al Alberts – stems from the fact that the lyric was based on an anonymous letter sent to a newspaper. 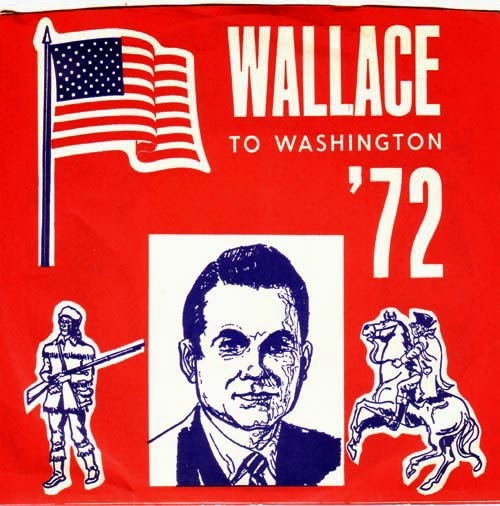 What’s interesting is that the song had been recorded some two years previously (without the Al Alberts credit and to the tune of John Brown’s Body rather than to the tune of America the Beautiful) by Frank W Morris, as the B-side to an election-boosting disc for our old friend Governor George Wallace. For more info on the Frank W Morris single - along with the artwork for the cover - check out Glorify the Turd. Anyway, here are both sides of the Al Alberts 45 as well as the Frank W Morris track for you to compare. "Wow, I guess there must have been something going around in the early 70’s, because it looks like Frank W. Morris caught the same thing Al Alberts had. Yep, Frank is a sick American, too, but not sick enough to make the A Side of this record—that honor was given to Chuck Atha and his ode to presidential candidate George Wallace. Pretty weak stuff, too. You mean you can’t find a better song to rip off than the “Ballad Of Davy Crockett”? No, Mr. Morris does a much better job in my opinion, and he has different lyrics than the Al Alberts tirade." Many - if not all - of this blog's regular followers will already know that we have a reasonably active Facebook page. If you're not already following the World's Worst Records on Facebook you might want to start. Although I try to post here every Friday, there's much more going on at Facebook. 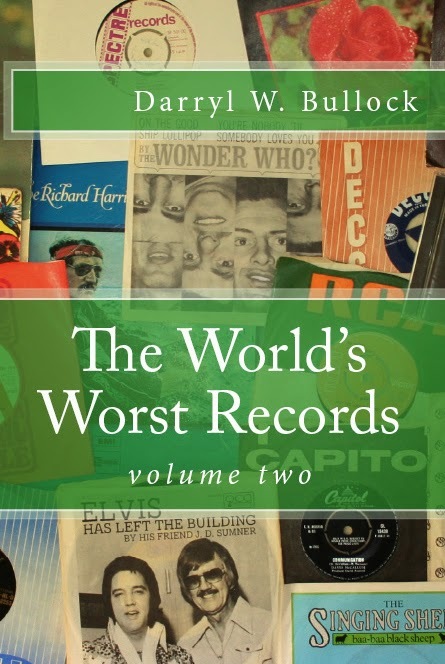 You wouldn't necessarily know, for example, that the second volume of the World's Worst Records book is almost ready - or that there's a full album's worth of material on Soundcloud for you to listen to. It's also a place where regular followers can post their favourite bad music clips, share information and make requests for future WWR posts. It's also an opportunity for you to meet other people obsessed with bad music. So, if you fancy even more bad music, why not come on over and join in the fun? Teenagers, according to New Scientist magazine, are a uniquely human phenomenon, known to be ‘moody, insecure, argumentative, angst-ridden, impulsive, impressionable, reckless and rebellious.’ Sounds about right to me; true, it was a long time ago now, but that pretty much sums me up during my teenage years. Teenagers are a relatively new phenomenon, unknown before the 1930 and not really recognised as a demographic unit until after WW2. A teenage boy of school leaving age, growing up prior to the end of WW2, was expected to join the services or get a job; teenage girls were expected to meet a man, marry and have kids. University was reserved for the privileged. Teenagers had limited freedom, no economic power and little influence in the decisions made by the older generation. After the end of the war everything changed. As the economies of the UK and the USA improved – and both rationing and conscription ended - parents began to have aspirations for their kids. There was a chance now that the next generation may achieve something: stay in education, have a life, enjoy their freedom and become more than just cannon fodder. However the post-war, pre-Beatles Britain really didn’t understand teenagers, and failed abysmally to cater for them musically. After the imported excitement of Elvis, Little Richard and the bitter disappointment of Bill Haley and his Comets (a huge act to Britain’s young rock ‘n’ rollers – until the band came to this country and people actually got to see them, that is. 12 hits before their 1957 tour: not one afterwards save for reissues) all they had was safe, homegrown cabaret star Tommy Steele, the mum’s favourite Cliff Richard and a clutch of middle-aged bandleaders and instrumentalists. If it were not for Lonnie Donegan and the skiffle craze then the teenagers of 50s Britain would have had nothing. Unless they joined a gang, that was. As the 50s turned in to the 60s very little changed. 1959’s biggest hit was Sidesaddle, a jolly, tack piano instrumental jaunt from Russ Conway. The following year the five biggest records in the country were Cathy's Clown by The Everly Brothers, Apache by The Shadows, Cliff Richard’s Please Don't Tease, Why by actor Anthony Newley and Shirley Bassey with As Long As He Needs Me. This was not music for ‘the kids’. Teen Street isn’t a totally awful record - Toni Eden has a good voice and the guitar work is exceptional - but what is awful is that this kind of vapid nonsense was being specifically manufactured to try and capture the teen market. The grey men in suits who ran the UK’s record labels clearly had not got a clue. Musically it’s pretty decent (if anodyne), but the ridiculous yelps from the backing vocalists are absurd and annoying, and the lyrics simplify a teenager’s life and ambitions down to little more than listening to a jukebox and waiting to get married. The A-side - No-One Understands (My Johnny) - tells the age old tale of a good teenage girl in love with a bad boy from the wrong side of the tracks: the same plot had been used a thousand times before and would be recycled again and again. No-One Understands was written by, and had previously been recorded by, American singer Pat O’Day. Born in 1940 (the actress of the same name born in 1927 is not the same person, nor is the Chicago-based singer who recorded in the late 60s), Toni Eden had been a featured singer with Ted Heath and his Orchestra. She appeared extensively on TV in the 60s, including guest spots with Morecambe and Wise and Ken Dodd, and also appeared with Kenneth Williams in the review One Over the Eight (1961) and in Lionel Bart’s flop ’65 musical Twang! as Maid Marian. 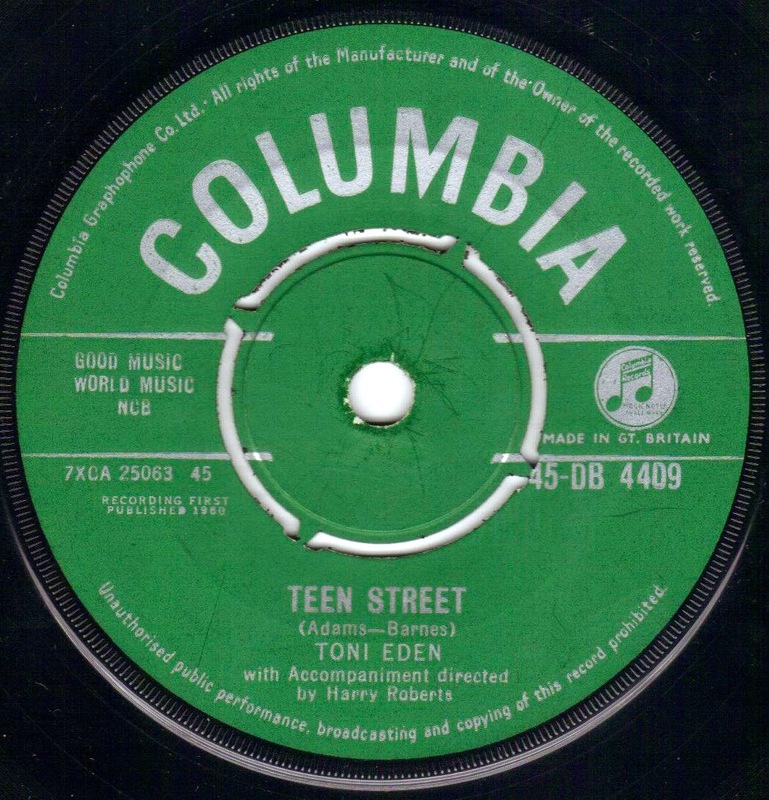 After three singles for Columbia, Toni Eden went on to issue one 45 on Decca (from One Over the Eight) and a brace of singles on United Artists. Teen Street was covered the following year by Janis Martin, who was occasionally known as ‘the female Elvis’. Howard ‘Boogie’ Barnes and Cliff Adams, the co-composers of Teen Street also wrote Grown Up Dreams, the plug side to Toni Eden’s follow up single and The Waiting Game, the B-side to her third (and final) Columbia single. The pair also wrote The Lonely Man Theme (used in the iconic advert for Strand cigarettes) and would later pen both sides of a promotional single for Smiths crisps. Cliff Adams was, of course, the founder of the Cliff Adams Singers, of Sing Something Simple fame; Howard ‘Boogie’ Barnes was an advertising copywriter. I’m not 100% certain, but I do not believe that he is the same man as Howard Ellington Riddiford Barnes, a songwriter who scored his biggest hit with I Really Don’t Want To Know, covered by (amongst others) Elvis Presley, Rosemary Clooney, Dolly Parton and Willie Nelson.